In the beginning, C++ was a hard language to learn because it required programmers to master low-level techniques to work with memory. Over the years, C++ has evolved to provide higher-level techniques that make it much easier to write effective code. But most C++ books haven’t evolved with the language. Until now. Now, this book uses modern C++ to get you off to a fast start, and then builds out your coding and OOP skills to the professional level. At that point, it also covers older techniques so you’ll be able to maintain the vast amount of legacy code that’s out there, as well as work with embedded systems that don’t support the newer techniques. Go to our instructor's site to learn more about this book and its instructor's materials. As a long-time trainer and developer in other programming languages, I thought of C++ as being an ‘unnecessarily’ complex language. 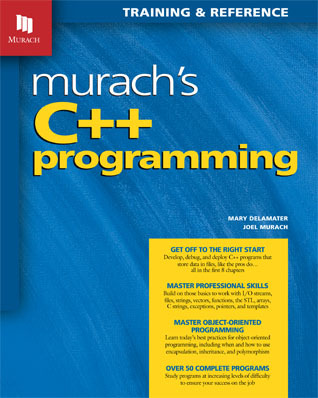 Murach has created a C++ book that eased my concerns. They started with app creation that I could do easily, and I firmly believe would be understandable by more novice programmers. I enthusiastically endorse this book for the high-quality learning material it is." This book is for anyone who wants to learn C++. If C++ is your first programming language, it helps you master all the skills and concepts you need to program in any modern language, as you learn C++ itself. If you’re an experienced programmer who wants to add C++ to your resume, it will help you learn C++ faster and better than you’ve ever learned a language before. And either way, once you’ve used it for self-training, it becomes your ideal on-the-job reference. Section 1 presents a practical subset of modern C++ that gets you off to a great start by showing you how to code, test, debug, and deploy C++ programs using an IDE (interactive development environment). This section works for both beginners and experienced programmers because it lets you set your own pace. If you’re a beginner, you’ll move slowly and do all the exercises. If you have experience, you’ll move more quickly, skimming through material you already know to focus on skills that are new to you or that you’ve never mastered. Section 2 builds on the subset to present additional C++ skills that programmers use every day. These include working with structures, enumerations, Standard Template Library (STL) containers and algorithms, built-in arrays, C strings, and exceptions. Section 3 shows you how to develop object-oriented programs in C++. This is a critical skillset in today’s world, and it complements the procedural skills you learned in section 1. When you complete this section, you’ll be able to develop programs that combine the best procedural practices with the best object-oriented practices. Section 4 expands your skills to make you an even more valuable programmer. Here, you’ll learn to work with memory and pointers to handle legacy code or embedded systems. You’ll learn to use templates that allow a class to support multiple data types for generic programming. And you’ll learn to develop custom containers and algorithms that work like the containers and algorithms of the STL presented in section 2. Like all our books, this one has features that you won’t find in competing books, all designed to help you learn faster and better. Here are a few of those features. As you page through this book, you’ll see that all of the information is presented in “paired pages,” with the essential syntax, guidelines, and examples on the right page and the perspective and extra explanation on the left page. This helps you learn faster by reading less...and this is the ideal reference format when you need to refresh your memory about how to do something. To show you how C++ works, this book presents over 50 complete programs that build from the simple to the complex. We believe that studying the code for complete programs is critical to the learning process... and yet you won’t find programs like ours, that tie all your newfound skills together, in other C++ books. Of course, this book also presents hundreds of short examples, so it’s easy to find an example that shows what you want to do. Even better, our paired pages make it easier to find the example that you’re looking for than it is with traditional books that embed the examples in the text. Like all our books, this one has exercises at the end of each chapter that give you hands-on experience in practicing what you’ve learned. They also encourage you to experiment and to apply what you’ve learned in new ways…just as you’ll have to do on the job. They start from partial programs that provide the boilerplate code, allowing you to focus on the skills you’ve just learned. And they tie a number of skills together instead of having you apply one skill per exercise…an approach that’s much more realistic and satisfying. To code, test, and debug C++ programs, you need to install an IDE and a compiler for C++. You can install those separately, but some C++ IDEs include a compiler. For example, installing Visual Studio on Windows also installs the Microsoft Visual C++ (MSVC) compiler. Likewise, installing Xcode on macOS also installs the open-source Clang compiler that can be used to compile programs in C++ and related languages. So this book covers those two IDEs. The appendixes show how to install them, and chapter 1 shows how to use them to develop C++ programs…although you can use any other IDE and C++ compiler that you want to. To see how well this book works for both new and experienced programmers, you can download its first two chapters in PDF format. By the end, you’ll be writing your first modern C++ programs. This chapter is a quick introduction to C++ programming that shows you how to use an interactive development environment (IDE) to develop C++ programs. This chapter presents a starting subset of modern C++ skills that lets you write your first programs. And we’re not talking about a few lines of “Hello World” code, but complete programs that get input from the user, process it, and display output. Appendix A for Windows and appendix B for macOS show how to install and use these files. On this page, we’ll be posting answers to the questions that come up most often about our C++ book. So if you have any questions that you haven’t found answered here at our site, please email us. Thanks!